Has anyone tried "Gooey Duck" clam? Sashimi? Fried? Boiled? In a sushi? Any opinion on its taste or anything? I actually like eating this a lot. The texture and taste is very nice. It is ideal for hot pot or stir fry =]. This thing is hella good!! hahaha gooey duck? 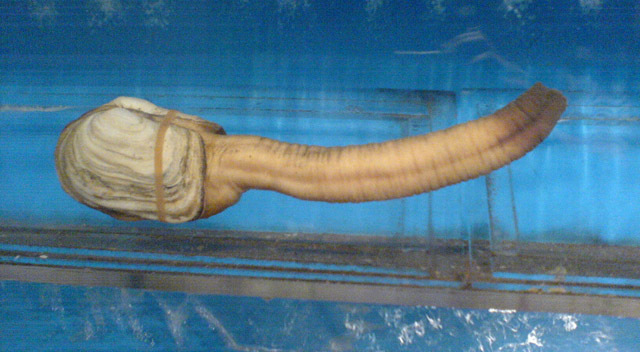 Er i googled it, its called Geoduck. i never knew what it was called in English. I just had it for hot pot last night Very nice. LOL This is my college's mascot! I've never had it, I would try it though. Does it taste like a clam? No one has tried it raw? my take is that if you like sashimi/raw seafood then chances are you'll enjoy geoduck raw too. Well... we call it zeong bat pong in Cantonese. As sashimi it's decent... Tastes better than it does in hot pot. A live geoduck costs over $70 (for its super fresh meat)... (ranging from 70 to 200 bucks because of exportation since I don't live near Washington state or BC province) Am I getting a good price? Thanks for the opinions! Hot pot for the win then! My boss says it is to die for. He swears the long part is the best kind of sashimi ever. He said to use the clam parts (inside the shell) stir friend. He says it cost like 100 bucks a piece so for 70 bucks that is a deal. It seems right, you figure about market price is $30/lb. If I find some I intend to try it. Such strange creatures in the world. Oh my haha I've never heard of it.. Doesn't look very appetizing.. Have any pictures with it on the dish? I eat so much of it.. it doesn't really have a taste to it ? Well tastes like seafood. My dad puts into congee and we have gooeyduck congee.